The result of a two year strategic investment project, Vaillant’s Green iQ answers the growing demand for increasingly energy efficient heating solutions that are supported by clear sustainability and performance credentials. Any Vaillant product carrying the Green iQ mark offers a guarantee that they are not only extremely energy efficient and deliver eco-friendly heat generation, but also fully equipped to take advantage of app-based heating controls and smart phone technology. In essence, Vaillant’s Green iQ products merge sustainable technology solutions with connected thinking to create future-proofed products that are green, intelligent, networked and, ultimately, market leading in the domestic heating industry. To qualify for the Green iQ mark, a Vaillant product must display the highest green credentials such as optimal efficiency levels, a high degree of recyclability, lowest running costs, socially responsible production and a proven build quality of the highest degree. At the same time, the product must also offer smart connectivity as well as intuitive and clear operation. 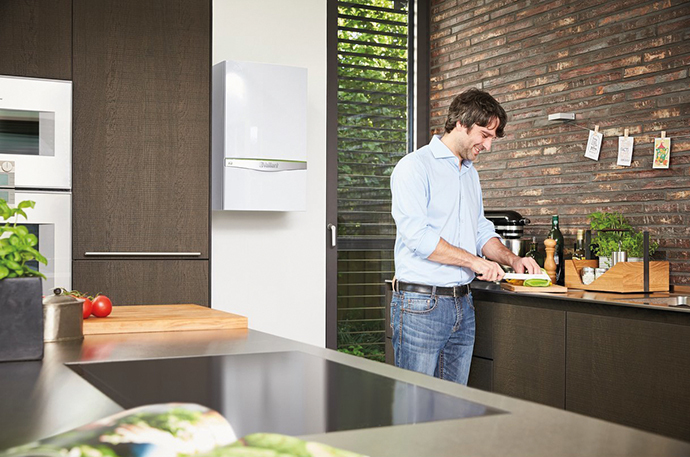 Being launched under the Green iQ badge is the ecoTEC exclusive range of boilers, which offer a 12% increase in efficiency when in domestic hot water mode, based upon an unrivalled ability to reduce flue gas temperatures to less than 30 degrees through a vastly improved and re-engineered heat exchanger. Energy efficiency is further enhanced through the Green iQ ecoTEC exclusive’s wide modulation mode, achieving up to 1:10 modulation, effectively providing heating and hot water from drastically reduced energy consumption. The Green iQ ecoTEC exclusive range offers a 27kW system model which features a Vaillant first for the UK – a built in diverter valve to improve comfort levels, hot water reheat time and ease of installation. Also launching are 35kW and 43kW combination boilers with a host of technically advanced features aimed at the discerning purchaser with the highest demands, and easily capable of handling much larger properties. Online connectivity is provided through Vaillant’s smart control, vSMART, which offers the home-owner total control of their heating and hot water system via their mobile devices, ensuring their Green iQ ecoTEC exclusive boiler operates at its optimum efficiency, and providing energy usage information back to the homeowner on both heating and hot water production from anywhere in the world. The range also comes with a Quiet Mark award, indicating to homeowners that these are amongst the quietest boilers on the market. In addition, 85% of the product is recyclable – demonstrating Vaillant’s commitment to whole life cycle product sustainability.